AYM launches Gauteng Youth Entrepreneurship Drive – "…Through My Eyes…"
With youth unemployment being at the highest levels since the advent of our democracy, entrepreneurship has been identified by many as a fundamental tool for breaking this vicious cycle. 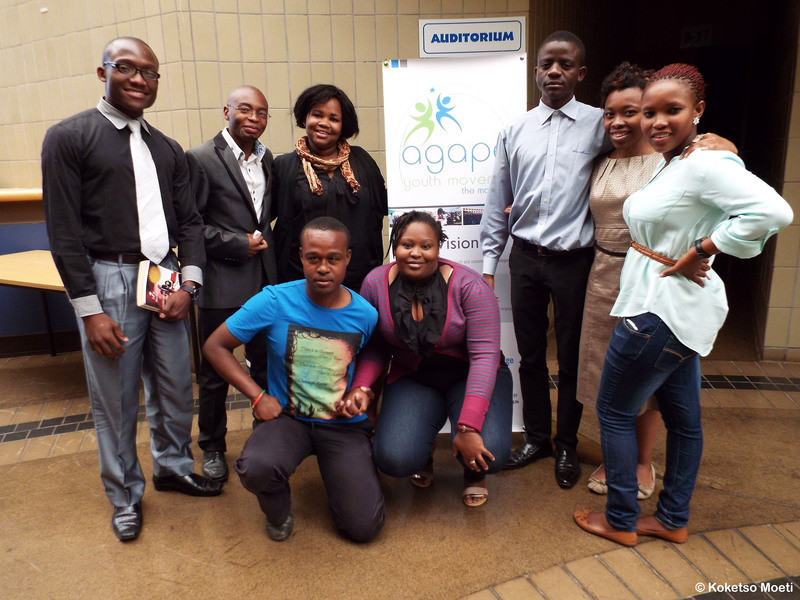 On Friday, 1 November 2013, Agape Youth Movement (AYM) launched a 12 month project called Gauteng Youth Entrepreneurship Drive (GYED) in Tshwane. According to Noko Ramoroko, who is currently President of AYM, the initiative “seeks to promote a culture and mind-set of entrepreneurship within the youth of Gauteng by creating opportunities to learn, network and leverage off each other’s knowledge, resources and enthusiasm”. 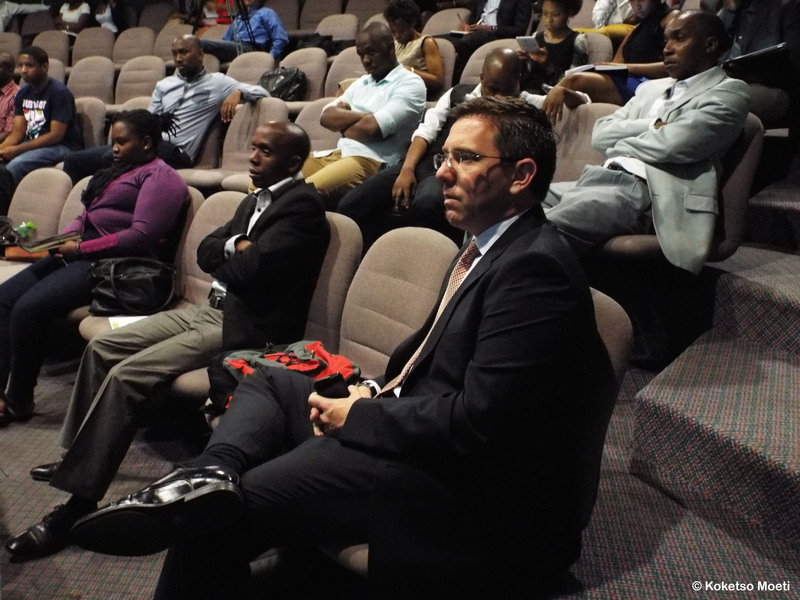 Prior to the launch, the organisation undertook a survey amongst participants to ensure that the event best met the needs of those who attended. Mr Harry Welby-Cooke from Action Coach. Aptly themed ‘Bridging the gap between young entrepreneurs and business support institutes’, the launch brought young, aspiring entrepreneurs; potential funders and support agencies together. Action Coach; Technology Innovation Agency (TIA); the Women’s Business Association; the City of Tshwane and the National Youth Development Agency (NYDA) were amongst those present. First National Bank was also in attendance, seeking to open their brand to youth and sharing their competitive business package for start-ups. Calvin Makhubela opened the day’s proceeding with a clear message about the need for those who have made it to give back and highlighted mentorship as an important way in which this can be done. “We are young and know what we want”, said the Activator. “But very often we are not sure of the path with which to get there”. He spoke strongly spoke about the lack of mentorship, speaking of the value it holds for young entrepreneurs. TIA representative Dr Sayed followed the powerful opening. “We have a strong innovation and entrepreneurship capacity in South Africa, however the question we have to ask ourselves is, do we have the necessary support for this capacity”. Dr Sayed went on to reflect on how the many good ideas in the country, never meet the market due to what he describes as an innovation chasm. Many people have good ideas, but have no technical skills to develop them whereas others have prototypes, but lack the business skills required. This was used to emphasise that funding alone is often not enough and support beyond funding is needed. His comments were met by many nods across the room, indicating a shared sentiment. The TIA has a dedicated youth programme, the Youth Technology Innovation Fund (YTIF), which supports technological innovation. However many misunderstand this, thinking that the programme is focused solely on IT- which it isn’t. Tech innovation merely refers to new knowledge and start-ups which fulfill a social need. Attendees had the rare opportunity to discover exactly how the fund works, as well as the processes involved. It was well-received that in certain instances, unemployed entrepreneurs could apply for a cash stipend to allow them to dedicate themselves fully to making their projects a reality. Whilst 150 guests had sent their RSVP, quite a number did not arrive. This didn’t bother Mr Henry Welby-Cooke of Action Coach at all. “The most important people are here in the room”, he said, “those who show up are the ones who rise up”. The Action Coach Executive Director made it clear right away that his mission was not to present the ideal picture of entrepreneurship, which would have everyone feeling like they want their own business. Instead he went on to share how for many established, successful business owners being an ‘overnight success’ often meant years of hard work. Throughout the day, attendees found themselves not only entertained- but also inspired by Activator Karabo Lekgalakgala who was the designated programme director. The shamelessly talented young man also used the opportunity to share his own entrepreneurial journey, which is a tale of perseverance and hope. Beyond taking the NYDA to task, those present displayed a high level of maturity. Questions from the floor suggested that a number of young entrepreneurs are very aware of the deep divisions in the country. Many questioned what those who support entrepreneurs are doing to reach youth in traditionally marginalised communities. 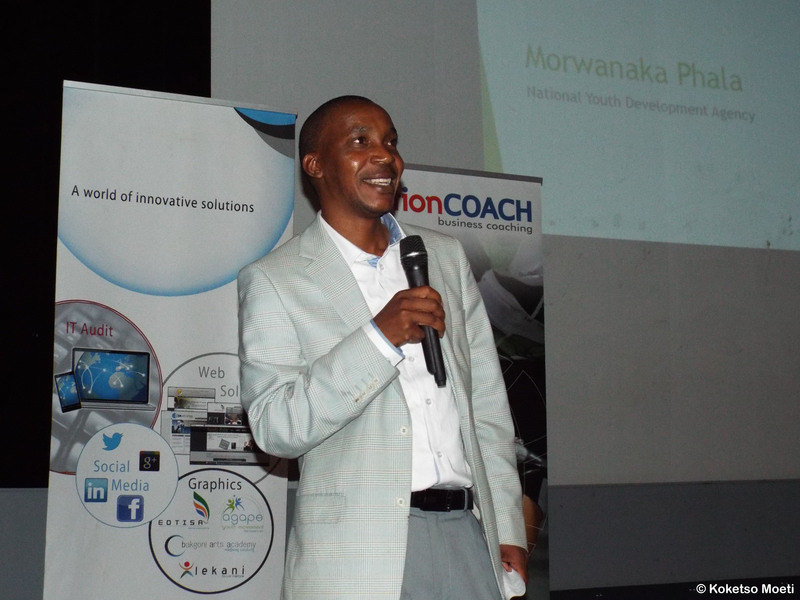 Mr Marwanaka Phala from the NYDA. Almost all presenters alluded that although they were attempting to reach beyond urban areas, there is still a lot to be done for a more inclusive approach. It was also admitted that achieving this required a more collaborative approach amongst agencies meant to support upcoming entrepreneurs, as current efforts are too fragmented. Although the event was focused on budding and aspiring entrepreneurs, the questions asked were a challenge that goes beyond entrepreneurship. It was a challenge for young people to constantly reflect the value they add to daily life, even in their individual capacities. Greetings!We are a gospel group by the name “Angelic sounds choir” from Pretoria. For the past three years together,we couldn’t think of anything better to do than spreading the word of God using our God given talents and the powerful language of music. We are looking for exposure and opportunities. We are blessed with the gift of versatility and we perform at church events,community events,concerts,live shows,conferences just to name a few. What do we have to do to perform at the events or functions hosted/organized by you? Your help in any way will be highly appreciated. Hi Tshepo, great work you are doing inf your community. Do not hesitate to email (info@aym.org.za) or call (+27 12 771 4705) us to find out on dates that we are doing projects in and around your community. Stay blessed! Unfortunately I do not arrange these events, I only attend them for work reasons, so I can unfortunately not assist. May I however suggest that you get in touch with Agape Youth Movement on info@aym.org.za Being a Tshwane based youth organisation, they may be able to assist. Really sorry that I can’t help. Thanks for publishing this article. Please email (ramorokant@aym.org.za) me some of the best pictures or dropbox them. This is a great article. Let the work that is done by this initiative be known in all parts of our country. Cheers Agape. Perhaps I should share that after this Seminar I decided to Pursue my dreams and resign from work. I am now an entrepreneur, who is doing well in the business sector. Briefly I am saying this was a force I needed to get out of my comfort zone and become all that I was created to be. Thanks Agape. Thank you for sharing your story Mr Elevator. What a bold move you’ve taken. We are sure going to support you where we can. Be on the look out for some of the seminars taking place this year. A proper communique will be sent to you and the rest of the people who came through for the seminar.